Feng Erkang is a Chinese historian and professor from Nankai University. 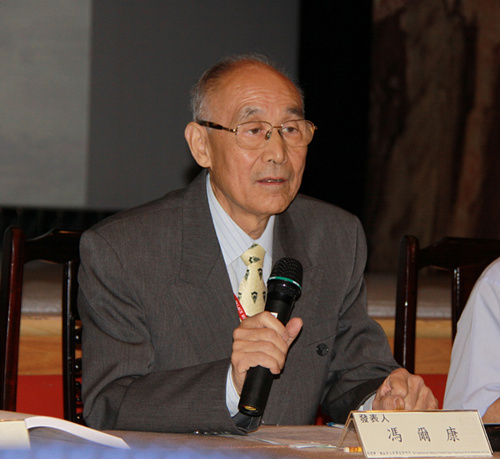 Born in China’s Jiangsu Province, Feng graduated from the Department of History at Nankai University in 1959 and continued to lecture there until his retirement in 2002. Currently, Feng is an honorary history professor of the university. He was also the former director of the Chinese Institute for Social History and the former deputy director of the Chinese Institute for Genealogical Studies. Feng is actively involved in lectures and studies on China’s social and ancient history as well as the science of historical materials. His works mainly include Biography of Emperor Yongzheng, Cao Xueqin and the Dream in the Red Mansions, Studies on Historical Materials of the Qing Dynasty, Outline of Chinese Social History, Clans and Ancestral Shrines in Ancient China as well as Modern Turn of Chinese Families Since 18th Century. Feng Erkang has played a key role in developing Chinese research on social history since the 1980s. Throughout a career that spanned six decades, he has adhered to the principle that “historical materials are the sole source of ideas.” Also, he has continued to seek historical truth and emphasize the application of academic studies, forming a research system based on dynastic history with particular focuses. CSST reporters recently sat down with Professor Feng to learn about his research methods and personal understanding of historical studies. CSST: You started learning history in the Department of History at Nankai University in the 1950s. At that time, a batch of renowned historians were teaching there, such as Zheng Tianting and Lei Haizong. How did they affect your historical studies? Feng Erkang: I began studying in the department in 1955 and continued to lecture there after graduation. Zheng Tianting and Lei Haizong were among the teaching faculty in the 1950s. Zheng affected me the most in terms of historical research methods. When I was an undergraduate, Zheng taught me the history of the Ming and Qing dynasties from the perspectives of elementary knowledge and special subjects, as well as an elective course about the science of historical materials. After that, I acquired a graduate degree under the supervision of Zheng, focusing on the study of Ming and Qing history. Zheng impressed me with his emphasis on documents and other forms of first-hand historical data, as well as textual research on the materials—he called it “criticism of historical data”—to investigate their veracity and explore the recorder’s opinion and behavior. That became my research principle too—that I have always aimed to seek truth. CSST: Dynastic historical studies conduct insightful analysis on research subjects but fail to examine the changing circumstances of the phenomenon. Does it explain your proposal that the historical studies on the Qing Dynasty (1616-1912) should be explored in the context of a larger time span? Feng Erkang: That’s true. It’s hard to get a deep understanding of many issues through studying a single dynasty, but the understanding would be better by examining a larger scope of history. For example, when I wrote the book Structures and Changes of Ancient Chinese Farmers, I found it inaccurate to use “state-owned” or “privately owned” to describe the multilevel ownership model of ancient China’s land mechanism. At this point, I adopted the idea of class stratification to analyze the constituents of farmers during the Zhou to Qing dynasties by considering commoner landlords as ordinary farmers. Here is another example. I tried to extend the horizon to modern times in my research on Qing history prior to the Opium War. To solve this, I read the chronicle of Emperor Daoguang and relevant historical books, thus finishing Social Problems during Emperor Daoguang’s Reign and Opium War and China’s Modernization. CSST: The history of Chinese clans is among your research interests. How did you investigate the history of Chinese clans in the context of a huge time span while keeping an eye on other contemporary issues? What breakthroughs have you made in understanding this field? Feng Erkang: I intended to explore Chinese history as a whole through researching Chinese clans. In addition to formation, membership, leadership and management, I explored changes in clans in terms of development and patterns. Also, it is necessary to look at their relationship with such external environment as country and society, and their position within the social economy and social structure. Studies on specific history should examine the past, the present and other social issues. That’s my fundamental rule. This method helps refresh our understanding of nature and the pattern of a clan society. For example, I had doubts about the argument that “ancient Chinese society is feudal and patriarchal.” I examined the argument from the perspective of the general history of clans. I found that the Zhou Dynasty (1046-256 BCE) adopted enfeoffment and a patriarchal system at the same time, thus forming a feudal society. The Qin Dynasty (221-206 BCE) abolished the enfeoffment system and shifted to the system of prefectures and counties. The Han Dynasty (206 BCE-220 CE) and some of its following regimes enforced the system of peerage investiture, which is totally different from the enfeoffment nobility of the regimes prior to Qin based on land, political powers and population. At this point, I didn’t agree that the dynasties after Qin and Han were feudal societies. I considered clans as a transformation of patriarchal society rather than a form of patriarchal organization. I also found that clans have a strong ability to adapt because they changed together with the social pattern. Any form of change conforms to the transformation of social patterns and social reforms. CSST: Social historical studies experienced a revival in the 1980s, which countered the popular statement that historical studies were in crisis. In your opinion, what promoted the revitalization? Why did you predict that historical studies would embrace a new phase based on research of social history? Feng Erkang: Independent thinking is a necessary attainment of people. Without it, academic studies would have no distinctive characteristics. Since the 1980s, the Chinese academics began to encourage independent thinking on a large scale. Many scholars were dissatisfied with past malpractices, such as rigid historical studies and doctrinaire books. In circumstances like this, a variety of substantial historical works were published. At first, I tried to figure out the nature of social history and how to promote research on it. The 1930s debate on social history mainly touched upon modes of social production and history of social pattern. In a modern context, I assume that social history should highlight the history of social structure and social life. In my 1987 article “Promoting Studies on Social History,” I proposed the definition that “social history is a specific history of historical studies” along with research methodology. I was truly aware that the definition was not perfectly accurate, but I proposed it for future discussion with my fellows. I was the chief editor of the 1988 book Outline of Chinese Studies on Social History, which is frequently read by a bulk of historical researchers. Also, my fellows and I organized the first seminar on social history. The Chinese Institute for Social history was established at the fourth session in 1992. CSST: How do you deal with the relationship between history of social life and that of social structure? Feng Erkang: I focused on the history of Chinese social life in the 1980s. I lectured for an elective course on Chinese social history in Nankai University in 1985 with an emphasis on history of life. Also, I began to write reading notes in regard to farmers, women and marriage because I have studied documents in these areas. The reading notes reflect my primary goal of researching and learning social history—to write vivid and substantial historical books for the general public. I finished two books about this area, Details of Ancient Social Life and Life of Qing People. Between the 1980s to 1990s, my studies mainly discussed history of Chinese social structure. As a sociological theory, social structure is the key to understanding the driving factors and characteristics of traditional China’s social development. I learned it and applied my reflection to my edited book Transformation of the Chinese Social Structure. I proposed the following features of the Chinese social structure in the book introduction: Hierarchy was the norm of social life. Patriarchal spirit penetrated into ancient social structure. Social structure underwent slight changes, and static agricultural society made slow progress. In the late 1990s, I shifted my attention to textbooks. I began writing Outline of Chinese Social History in 1998 and finished it six years later. The textbook consists of three parts. In many cases, theories are illustrated from the perspective of scientific principle. However, I chose instead to explain theories by drawing on my research on social history, because it is more practical. I contributed my experience of collecting historical materials to the second part. The third part touches upon the structure of Chinese society and history of social life. CSST: At present, how should history deal with its relationship to reality and serve it? Feng Erkang: Historians have never stopped seeking truth and applying it throughout history. History served politics in the ancient times by advising emperors on governance. In my opinion, contemporary history is serving society and public readers by providing them with insightful historical knowledge, thus allowing people to learn from the wisdoms and failures of the past. Seeking truth is the principle and root of historical studies. History can only be applied based on truth. Chao Tianyi and Zhou Xuejun are reporters at the Chinese Social Sciences Today.